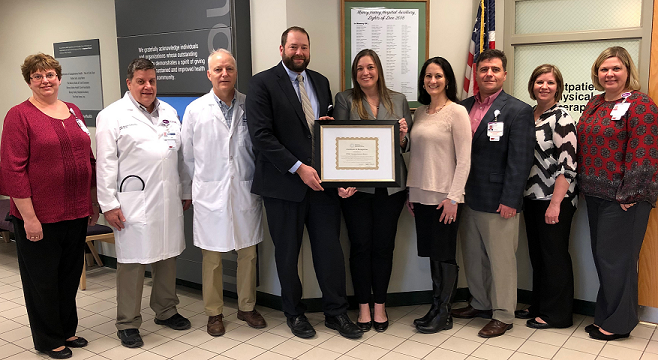 Pictured left to right: Sharon Adams, Unit Director Emergency Department (ED), UPMC Susquehanna Muncy; Dr. John Moskaitis, Medical Director of Hospitalists for Medical/Surgical Unit, UPMC Susquehanna Muncy; Dr. Mark Beyer, Medical Director of ED UPMC Susquehanna Muncy; Matt Mclaughlin, Chief Operating Executive, UPMC Susquehanna Muncy; Jennifer Edwards and Lannette Johnston, Pennsylvania Office of Rural Health; Peter Strecker, Regional Program Coordinator, Telehealth, UPMC Susquehanna Muncy); Janai Arbogast, Unit Director Medical/Surgical Unit UPMC Susquehanna Muncy; Andrea Reed, Director of Nursing UPMC Susquehanna Muncy. Having the ability to treat complex patients via telehealth at UPMC Susquehanna Muncy decreases the need to transport patients to and from remote locations, lowers overall costs to the health system, and improves financial and operational outcomes. Additionally, their Hospital Consumer Assessment of Healthcare Providers and Systems (HCAHPS) (patient satisfaction) scores have increased across multiple measures.